Fluff and Fripperies' latest post series, Made in Ireland, will feature some great Irish brands; last week, we took a look at the natural skincare line, Human+Kind, and this week I have another 100% natural, Irish-made range to tell you about, from The Handmade Soap Company. It's the brainchild of former thatcher Donagh Quigley and his partner Gemma, who were feeling the effects of the economic downturn and on the hunt for a new business idea. It came to them on holiday, in the form of a brilliant bar of handmade soap, which led them on a journey to study soap production and a mission to make 'the best bar of soap in the world'. In the early days everything was done from the couple's kitchen but as the company grew they moved production to a workshop in Kells, Co. Meath. The range now includes soaps, face creams, hand creams, shower gels, body butters, lip balms and more, all handmade using high-quality natural ingredients, locally sourced where possible, and with no sulphates, parabens or petrochemicals. The first collage shows my pictures of the moisturiser cream; this one shows some stock images of the brand, to give you a flavour of their product range. I haven't actually tried these ones myself. 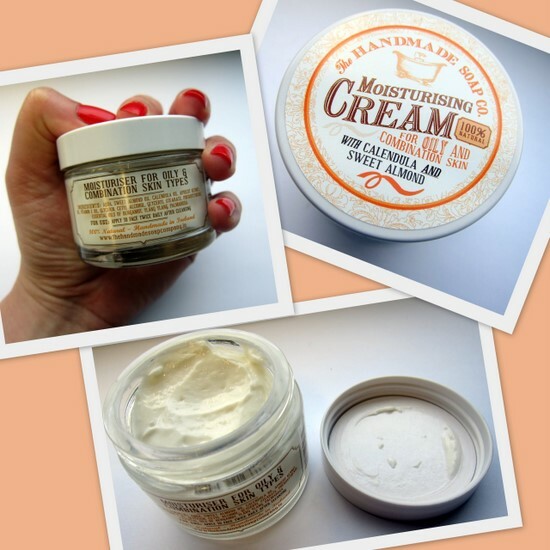 The finishing touch is the gorgeous retro packaging: the product I was given is the Moisturising Cream for Oily and Combination Skin, and it comes in a heavy glass pot with vintage-style labelling. It's a lovely product, too: it feels quite rich but it's not too heavy for my skin, it's absorbed quickly and it also makes a great base for makeup. And it smells wonderful, really warm and inviting, thanks to ingredients like essential oils of bergamot, ylang ylang and palmarosa. Prices range from €4.50 for a lip balm or soap, to €6.95 for a shower gel, €9.95 for bubble bath or up to €24.95 for a moisturiser. There's a full list of stockists on the company's website, and you can also buy online. Irish online beauty retailer, Cloud 10 Beauty, carry the range too. 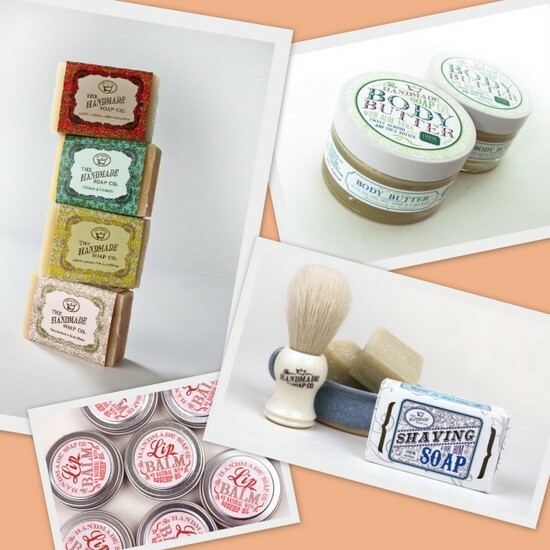 Have you tried anything from The Handmade Soap Company, or are you tempted? Really like the look & feel of this brand! i agree with adele! they look very very nice! WOULD LOVE TO TRY THAT CREAM OUT. Thanks for the introduction! They seem to have a great product range and gotta love a natural product that works! oooh I've been really into natural products like this lately actually. The body butter is so cute. All the packaging is so cute! The packaging is super cute!! I always love to find new good quality Irish brands. I'd love to give them a try, love the vintage packaging too! it's great to see how some people have taken risks in the current economy, I hope they have great success! I love handmade soap. It's my favorite kind to use. It looks really good and I love the retro packaging. Great idea for a post - you might get Eire out of a recession yet Emma ! I am loving all your made in Ireland products that you're featuring, this one looks amazing! The packaging is so fun and vintage-y! Looks like good stuff! Love the packaging, they would make for great gifts and such a reasonable price! i would LOVE to try out this fabulous seeming brand - nice!! I have bought a few of their products and they are amazing! I am a bit of a lip balm addict and don't normally go for flavoured ir scented ones but these are really good. The body lotion is so nice it leaves your skin super soft and the smell is fab too. They make brilliant gifts too. Love this range and can't walk past the Kilkenny shop on Nassau st without popping in to either purchase or at the very least a good sniff and a dollop of their great handcream. Business is all about having a unique idea and being creative about it. These couple prove how effective it could be. They weren't afraid to take the risk, and I'm glad to see that it turned out to be very successful for them.